Important Update 2009-12-01: Urbanoutfitters.se was never hacked. The guy who took control over the site has been the owner of the domain name for several years. Anything illegal has therefore never happened. It has been some tough days for the Fashion store Urban Outfitters during the weekend but it has been even tougher days for the employees. But thanks to the Internet and social media the fight is on. Three days ago I read at Habit.se that the fashion store Urban Outfitters is terminating all its staff in Stockholm after they requested a collective agreement. Of course I thought Urban Outfitters treats their staff badly but I didn’t think much more about it at that point. And since I had a weekend without a computer in front of me I kind of missed the upcoming storm. Yesterday, on the train back home I read the Twitter feed on my cellphone and understood that urbanoutfitters.se was hacked since Saturday afternoon. When I came home I realized that the page was a search generated twitter feed on the keywords urbanoutfitters.se and #urbanoutfitters_se. Most of the tweets were from people stating they were going to boycott Urban Outfitters or wishing them a bad Christmas sales. Badly enough I didn’t take a screenshot of it, something I really regret today and this morning Urban Outfitters had control over their site again (it took a pretty long time in my opinion). Nikke Lindqvist took a screenshot with his iPhone though, at the Saturday when the page pointed to the new Facebook group. Urbanoutfitters.se looked like this during the saturday.Screenshot by Nikke Lindqvist. As I wrote above there was a new group at Facebook called Shame on you Urban Outfitters. At the moment the group has 8.420 members and it’s steadily increasing. Together the group members are gathering facts and links to articles about the situation and spreading the word all over Facebook. There is also a petition started at namninsamling.se which at the moment has got 680 signatures and the articles at Aftonbladet Debatt have totally got over 300 comments. Today there have also been people handing out flyers outside the store. Personally I usually don’t sympathize with hackers. 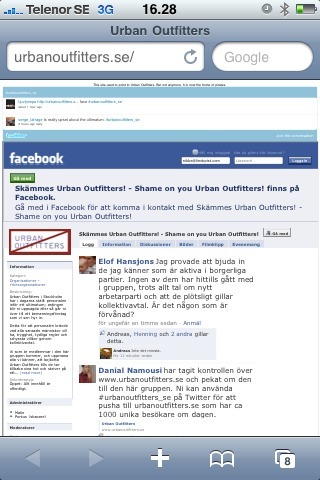 Now I don’t know what kind of relation the guy who hacked took control over urbanoutfitters.se has to the company. I do not have any insight in the company itself either so I don’t know much of the story behind the situation and maybe someone felt that this was the only way to get the discussion started. What I know for sure though is that I like how social media can be a tool for people to gather up and discuss about situations that engage them. Without the Internet, Twitter, Facebook, blogs and the comments on Aftonbladet.se, the discussion about the situation of the employees at Urban Outfitters wouldn’t have gotten proportions anywhere near this. Hereby I declare this as a good example of how social media can be used for good purposes. And now we can only hope for the best for the employees at Urban Outfitters. 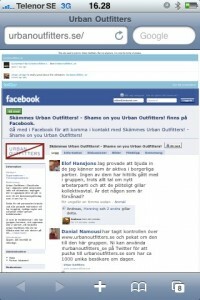 Here is the story about Urban Outfitters according to the local news at TV4. The report is after 2 minutes and 34 seconds.